This Cape Dutch retreat and Cape Winelands country hotel is located on a beautiful wine farm near Stellenbosch. Beautifully restored and decorated with exquisite antiques, this Cape Winelands country hotel offers spectacular sunset and Table Mountain views from its vineyard setting. 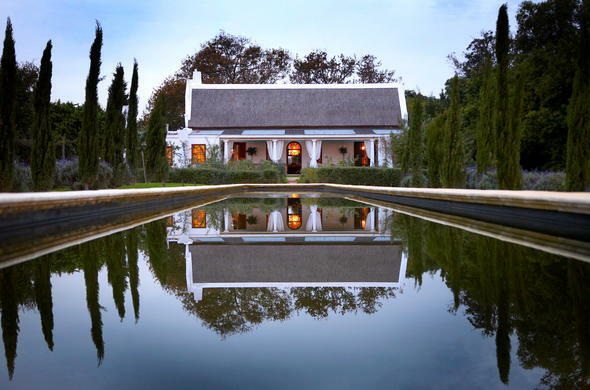 Hawksmoor House is a Cape Dutch country retreat on a 220 hectare working wine farm near Stellenbosch. An excellent place to relax and unwind, Hawksmoor House offers an unspoilt, unpolished and authentic country home experience, where guests can enjoy a well-deserved rest. The much loved resident German Pointer dogs, Cosmo, Max, Alice and little Jack, keep a watchful eye on the daily farm activities and love to accompany guests on walks. The manor house contains a grand dining room, drawing room with fireplace, an honesty bar and a small library with internet access. There is a magical wine cellar with fireplace and a classic wine tasting room. The real farmhouse kitchen features an AGA stove and direct access to the herb and vegetable garden. The grounds of Hawksmoor are laid with lawns, lavender beds and roses. In these tranquil surroundings are the reflection pool and swimming pool, with big sky views and Table Mountain on the horizon. A fence around the entire property provides privacy and security.